Barbara Elizabeth Conley, 75, of Lucedale, MS, went home to be with her Lord and Savior on April 5, 2019, after a hard fought battle against cancer. Barbara was born on August 20, 1943, in Jeffersonville, IN, to the late Ernest Edward Knowland and Dorothy Elizabeth (Chapman) Massey. She was for many years, a faithful member of the Lions Club. She also loved children and for years was very active with the Toys for Tots Organization and participated in Operation Christmas Child through her church. Barbara was a diehard Kentucky Wildcat fan and loved playing Bunco & Bingo with friends. She was a member at Wade Baptist Church and enjoyed spending time with her church family. Barbara was preceded in death by her parents, her husband, Russell V. Conley and a brother, William E. Knowland. She is survived by her daughter, Barbara Ann Phelps, brothers Richard E. (Shirley) Knowland and Joseph N. (Cynthia) Jones, Jr., step sisters Deberah Massey and Janice Cibolski, along with several nieces and nephews. 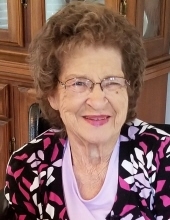 The visitation will be held on Wednesday, April 10, 2019 from 10:00 a.m. until 11:00 a.m. at Wade Baptist Church. The funeral service will immediately follow at the church beginning at 11:00 a.m., with Bro. Branden Rogers officiating. A graveside service will be held on Sunday, April 14, 2019 at 2:00 p.m., Mount Holly Cemetery, Fairdale, Kentucky with Pastor Josh Greene of First Baptist Church Fairdale officiating. To send flowers or a remembrance gift to the family of Barbara Elizabeth Conley, please visit our Tribute Store. "Email Address" would like to share the life celebration of Barbara Elizabeth Conley. Click on the "link" to go to share a favorite memory or leave a condolence message for the family.